ANKARA, Turkey (AP) — A Turkish court on Friday sentenced two Syrian smugglers to four years and two months each in prison over the deaths of 5 people including 3-year-old Aylan Kurdi, who galvanized world attention on the refugee crisis when a photo was published of him lying lifeless on a beach. The court in the Aegean resort of Bodrum convicted the two of human trafficking but acquitted them of the charge of causing the drowning deaths through deliberate negligence, the agency said. The image of the Syrian boy's body, face down on a Turkish beach, graphically illustrated the magnitude of the migrants' suffering. Aylan's brother, Galip, and mother, Rihan, were also among the five victims who drowned when their boat went down in the ill-fated journey from Bodrum to the Greek island of Kos last year. While Turkish authorities have given the boy's first name as Aylan, his aunt says the family prefers that it be transliterated as Alan. Trials in Turkey usually take months — even years — to conclude, but the verdict, which came at the end of the third hearing just a month after the trial opened, appeared to be an effort by the country to show that it is cracking down on human traffickers, just before Monday's summit between Turkey and the European Union to discuss the migrant crisis. Turkey is under pressure to reduce the tide of migrants to Europe and to combat the smuggling rings since it reached a deal with the EU in November. Under the deal, Turkey is scheduled to receive a 3 billion-euro ($3.26 billion) fund to help the country deal with Syrian refugees. The defendants, Syrian nationals Muwafaka Alabash and Asem Alfrhad, had denied any responsibility in the migrants' deaths. 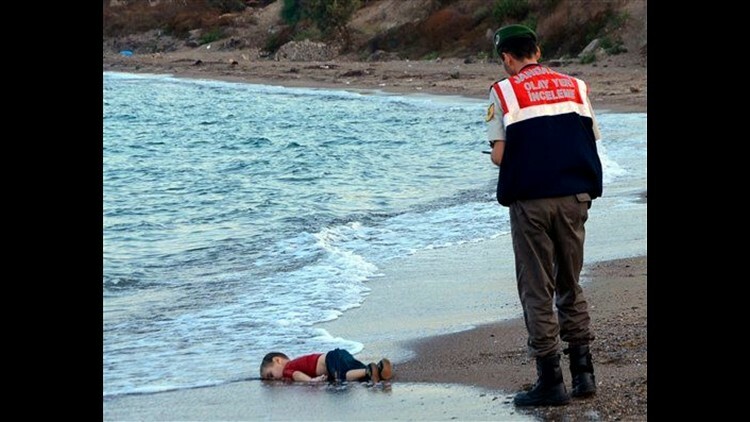 Instead, they blamed Aylan's father, Abdullah Kurdi, for the deaths — accusing him of organizing the trip. The court initially sentenced them to five years in prison each, but then reduced the term to four years and two months due to the defendants' good behavior during the trial and other legal reductions. The pair can appeal their conviction. Prosecutors had initially sought the maximum 35 years in prison for each. The Kurdi family was among hundreds of thousands who risked the journey to Greece in the hope of then heading to wealthier nations in northern and western Europe. After the deaths of his family, Abdullah Kurdi has returned to Syria. The International Organization for Migration says at least 418 migrants have died this year alone while trying to cross into Greece or Italy. Turkish officials say authorities in 2015 detained more than 4,400 smugglers who organized the often-dangerous crossings in frail boats.